The beginning of this week was really interesting. Our kitchen was buzzing with cooking and baking. Occasion was Father’s Day. My lil daughter is growing up. She now keeps a track of all these occasions and celebrates them with gusto. This year for the first time Father’s Day was celebrated in our home. I was involved with my plan for my father and she was confused and irritated at not being able to finalize on the cake recipe for her father. The complexity of our plan was aggravated by the fact that all cooking and baking had to be done when our fathers were not around. We were left with just a few hours during the daytime and the erratic power supply due to excessive rain added to the woes. Arguments and contradictions finally led to some kind of consensus and the two recipes were finalized. She wanted me to bake a WackyChocolate Cake. My frantic search for something special for my dad reminded me of a lovely recipe by David Lebovitz that I had bookmarked some time ago. It turned out to be very apt for the occasion. My father loves chikkis. 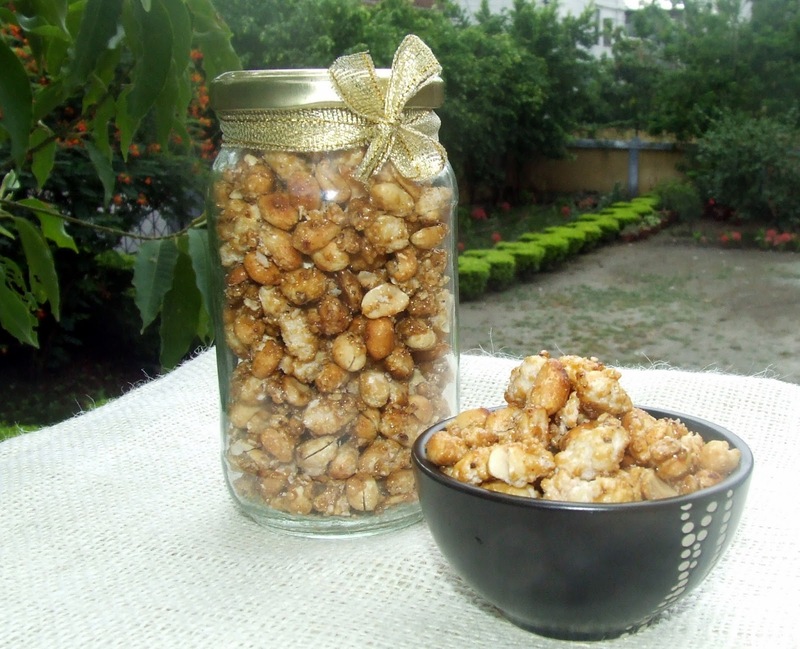 Every winter he makes peanut chikki(peanut brittle), sesame chikki and coconut chikki. Even after marriage when I moved out of my home, my box of peanut chikki reached me year after year without fail. 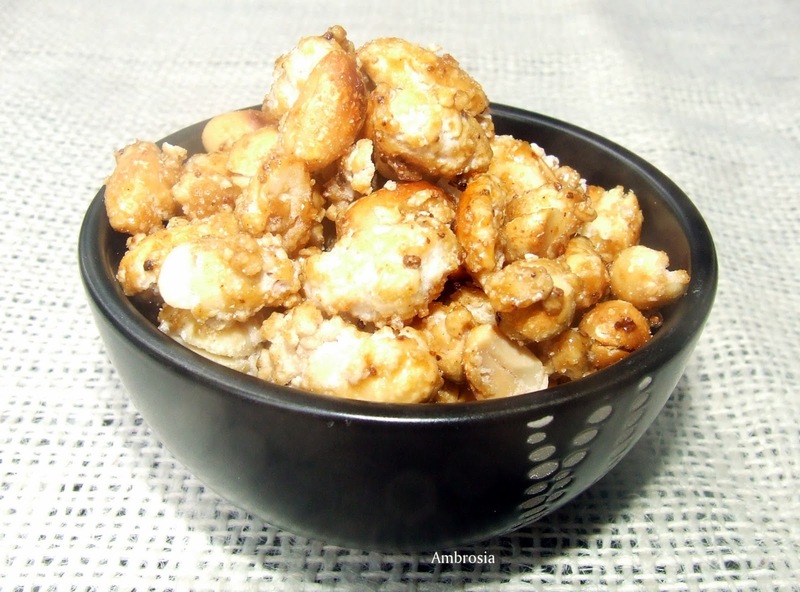 How I relished the chikki and my father’s love for me. I had to make this to reciprocate my love for him. The appeal of this recipe lies in its simplicity and great taste. A big Thank You David Lebovitz for making my day so special! Take peanuts in a heavy bottom steel wok. Add sugar and water. Cook over medium flame stirring frequently. After some time, water dries up leaving a sugar coating. Keep stirring. It dries up further and mixture becomes dry and sandy. Lower the heat. Sugar begins to caramelize at the bottom. Keep stirring and coating the nuts with caramel. Remove the wok from the flame from time to time to avoid burning of the caramel. Keep tilting the wok and keep stirring so the nuts get coated with caramel evenly. Turn off the heat, sprinkle salt and cinnamon. Stir to mix evenly. Transfer the nuts to a plate to cool. Break the clumps if any. Store in an airtight container. Click here to read the health benefits of Peanuts. 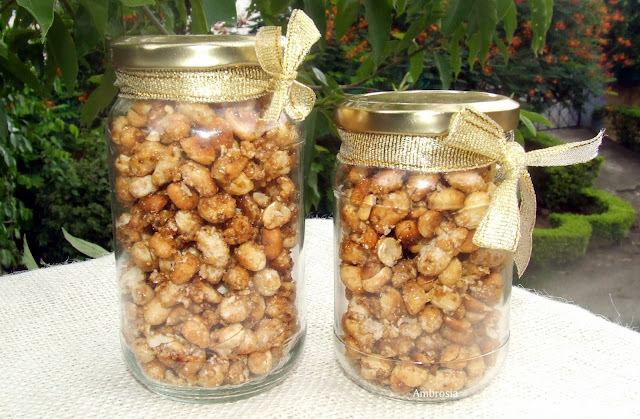 lovely way to have peanuts. What a sweet and thoughtful gesture!! Loved the presentation in the jars with the golden ribbon. Adore candied peanuts!! These look yummy! Could you please share wherefrom you got these lovely glass jars? Hello Jayashree, these are ordinary glass bottles available at the stores that sell cookware.